The year 2012 marks a number of important anniversaries. 70th Anniversay of the George Cross Award to the Island Fortress of Malta on 15th April 1942. The presentation ceremony took place on 13th September 1942 at St George Square, Main Guard, Valletta. 100th Anniversary of the Titanic which sunk during the early hours of the morning on 15th April 1912. 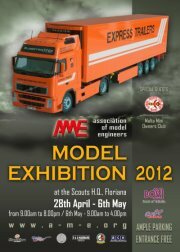 Visit AME Model exhibition and see models related to these anniversaries.